A rubber bumper MG Midget may not be the best British sports car you can buy, but it's fun for dollar quotient is hard to beat. Introduced in 1961 and based on the original Austin Healey Sprite, the MG Midget was old even when it was new. For the first 13 years of its life very little changes were made to the car. It got roll up windows, a heater, a revised rear suspension, and the "A Series" engine grew from 948 ccs to 1275 over the years, but little else changed. In 1975 the Midget saw its first real change and most people will say it was not for the better. In order to meet the then new US regulations the Midget got a big rubber bumper in the back and a full rubber nose in the front (as did its big brother, the MGB). It's ride height was also increased. The A Series engine was replaced with a Triumph sourced 1500cc engine. The MG Midget was a never a fast or spectacular handling car and the extra weight of the bumpers, the emissions controls on the engine and the change in ride height did nothing to improve any of that. So why buy a Midget, especially a rubber bumper one? Simple. They're cheap and they're the real deal. These are not Miatas, they are authentic old school British roadsters that can be bought for relatively little money. They are fairly durable cars that are easy to work on. Parts are easy to source and they have great club support. The MG Midget listed on eBay is described as a "very nice '10 footer' driver quality car". As Midgets will never be collector's cars, that's exactly the type of car you want. Click here to see the eBay listing for this car. If you really hate the look of the rubber bumpers, earlier chrome bumper Midgets can still be found on eBay or Craigslist, but usually sell for more money. MGMidget.net (a UK site) has a lot of great info. Click here to see their website. Click here to find the MG Drivers Club North America website. 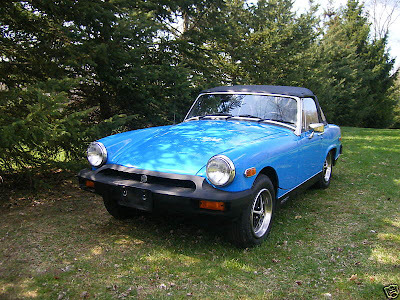 1978 MG Midget (parked for a couple of years in my garage and not started). Great condition before parking. Original tires (flat now). I need someone near Huntington, WV or Chesapeake, OH to get it running again. Can you help? Have a 78 i need to put up for sale. need interior seats. prob new brakes system and tires. Have no idea how to price. any suggestions. hasnt been driven for over 15 years.